VIPAccessEXCLUSIVE: Tyler Alvarez Exclusive Interview With Alexisjoyvipaccess At The NickSports “Little Ballers” Special Screening! It’s the highly-acclaimed, hit Nickelodeon TV show that has fans mesmerized with each and every episode. It’s the show that has just been honored with a Nickelodeon Kids’ Choice Awards nomination for “Favorite Kids TV Show”. It’s the show that has just wrapped up one of the most highly-anticipated season finales that has ever aired on TV. Yup, I’m talking about one of the most magical shows to air on TV – the wonderful, Every Witch Way. Every Witch Way fans worldwide love and adore the immensely talented, profound actor: Tyler Alvarez who plays the spectacular role of “Diego Rueda” – your average, or shall I say, “not-so-average” teenager who balances his teenage life with being a Kanay! Tyler Alvarez is without a doubt an absolute sensation and a household name. With his stupendous talent and his effortless acting skills, it’s clear to see why fans all over are under the “Tyler Alvarez Spell” and just can’t get enough of this charismatic and charming actor. Despite being a trending star, Tyler Alvarez still manages to stay so humble and his hard-work and dedication to his work allows him to reach above and beyond in his career. This year will be another phenomenal and brilliant year for the stellar Tyler Alvarez and his bright and shining career! 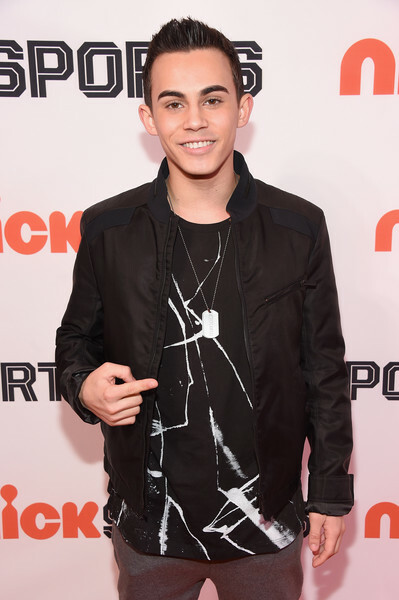 The amazing Tyler Alvarez had a great time as he attended and showed his support for the special screening of NickSports / Nickelodeon’s documentary “Little Ballers” on February 14, 2015 at Chelsea Piers in NYC. I, Alexisjoyvipaccess had the greatest honor of covering the prestigious NickSports / Nickelodeon special screening of “Little Ballers” and had the great pleasure of interviewing the magnificent and outstanding Tyler Alvarez! The wonderful Tyler Alvarez dishes exclusively to Alexisjoyvipaccess all about what he was looking forward to the most at the “Little Ballers” special screening, what his favorite episode he has filmed for Every Witch Way is and so much more only in our VIPAccessEXCLUSIVE interview! The fantastic Tyler Alvarez also spills on what superpower he would like to have – find out his answer only in our VIPAccessEXCLUSIVE interview below! Thanks for the excellent interview, Tyler! Check out my VIPAccessEXCLUSIVE interview with the extraordinary Tyler Alvarez at the NickSports / Nickelodeon special screening of “Little Ballers” below! Be sure to tune in to the premiere of “Little Ballers” on February 25, 2015 at 9:00 PM ET during the NickSports programming block on NickToons! Previous VIPAccessEXCLUSIVE: Breanna Yde And Benjamin Flores Jr. Exclusive Interview With Alexisjoyvipaccess At The NickSports “Little Ballers” Special Screening! Next VIPAccessEXCLUSIVE: Alexisjoyvipaccess Recaps The Inspiring And Uplifting Special Screening Of NickSports / Nickelodeon’s “Little Ballers”!